Photo of a dry swale. Courtesy of Limnotech. Green Infrastructure: Swales can be an important tool for retention and detention of stormwater runoff. Because they utilize vegetation, swales provide additional benefits, including cleaner air, carbon sequestration, improved biological habitat, and aesthetic value. 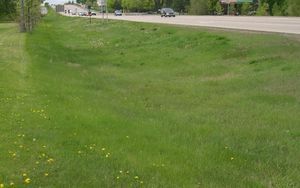 Dry swales, sometimes called grass swales, are similar to bioretention cells but are configured as shallow, linear channels. They typically have vegetative cover such as turf or native perennial grasses. Dry swales may be constructed as filtration or infiltration practices, depending on soils. If soils are highly permeable (A or B soils), runoff infiltrates into underlying soils. In less permeable soils, runoff is treated by engineered soil media and flows into an underdrain, which conveys treated runoff back to the conveyance system further downstream. Check dams incorporated into the swale design allow water to pool up and infiltrate into the underlying soil or engineered media, thus increasing the volume of water treated. This page was last modified on 21 May 2018, at 08:31.